Hello! This is the RPG Crawler and welcome to my new site/blog! I'd been considering something like this for a while, and felt it was high time to put together a site in support of my Youtube channel. Of course, I intend to offer more on this site than just a rehash of what you can find there. In the event of any problems with the channel, an update can be posted here, for instance. 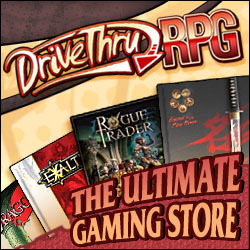 Furthermore, I have plans to begin written reviews about RPG products, both computer games I don't have time to make videos for, as well as tabletop games that might be better reviewed with a full writeup. I would also like to occasionally throw the occasional short story or adventure up for interested parties to take a look at, either in whole or as a preview of something to be released elsewhere. But those who've followed my channel know how well I do with plans. For now, I'll just be satisfied to be able to keep my viewers (and now readers) entertained and updated. So we'll have to see if I do well at this blog thing, since it's all new to me. Here's to hoping I can bring at least a few of these ideas to fruition! Until next time!